Lysa’s family is from Maine, where the couple lives together, and Gerald’s family is from California. They figured since they had bicoastal families that a destination wedding could be the easiest route. The final decision was based on how easy the process proved to be. They decided on the Royalton White Sands resort after going back and forth to different destinations. Lysa liked that the resort had a beautiful gazebo with ocean views, while not being directly on the sand. 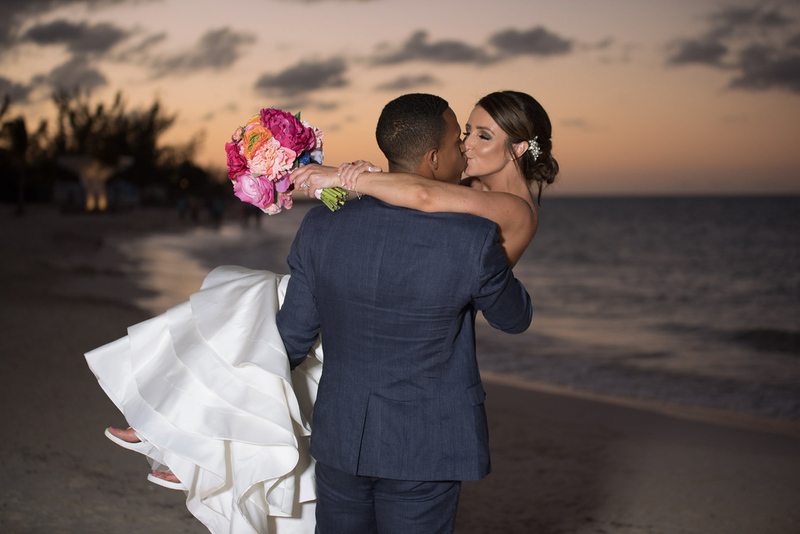 The couple said, “The resort matched our carefree vibes as a couple.” They booked with a year in advance and admitted it was nerve-wracking waiting for the planning process, which didn’t begin until a few months before the wedding date. But once the planning began Lysa said the wedding coordinator was very attentive and responsive to emails and phone calls, sent pictures, and was very helpful. The couple went early to spend time alone at the resort before guests arrived. Their wedding dates also fell across the same dates as their birthdays, so they were able to have a romantic candle-lit dinner on the beach as compliments of the resort. For their wedding, they decided to bring most of the decor with them because it was much more cost-effective. Some of these items included candles, centerpieces, and bouquets. The night before the wedding the couple hosted a welcome party for all of the guests featuring a catered meal and a Jamaican band. Gerald stayed in a friend’s room while Lysa stayed in the Presidential Suite, where she would get ready the next day. In the morning Lysa said, “I had coffee on the balcony, taking it all in.” She brought her own hairdresser as a guest, and with a makeup artist, she and the bridal party spent the day getting ready while listening to music and drinking champagne.They held their ceremony at the beautiful wedding gazebo, with oceanfront views. Afterward, they took photos as the sun began to set, and met their guests at a cocktail hour. For the cocktail hour and reception, they went with all local food, including jerk chicken and a full Jamaican style buffet. Everyone spent the rest of the vacation hitting the pool and beach, and with 35 guests in attendance, everyone was friends by the end. After booking Lysa joined Facebook groups featuring Royalton brides, where she got advice from. She recommends it to future brides as she felt like she knew where everything was at the resort, and it made planning easier. She also took pictures at home of her setup beforehand, such as how she wanted her centerpieces to look, and the wedding department replicated them perfectly. The couple said it’s the perfect trip to enjoy time with your closest loved ones. It was the best part, I had never been on a vacation with a group that large, and that’s what made it so fun.